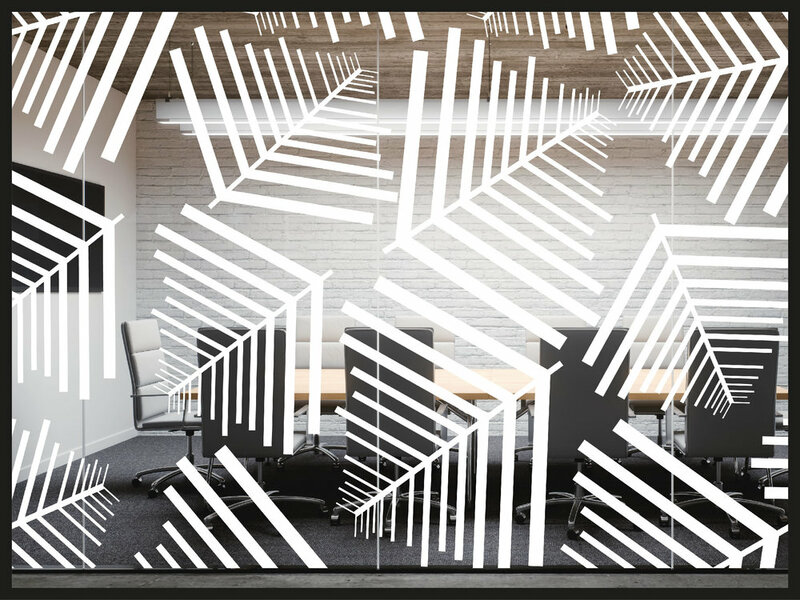 Nature has been an inspiration for design for as long as Design has been a concept, and our latest inspiration looks somewhat like a geometric ‘Fern’ that could add a new dimension to your office fit out. Depending on your space and current furnishings the stark lineal approach to this pattern could offer a really bold contrast while at the same time remain in line with your company style and focus. For more inspiring designs be sure to check out all our new designs on Pinterest! To celebrate this months new design release, we thought we would show you an alternative way to create a impressive look within your office. 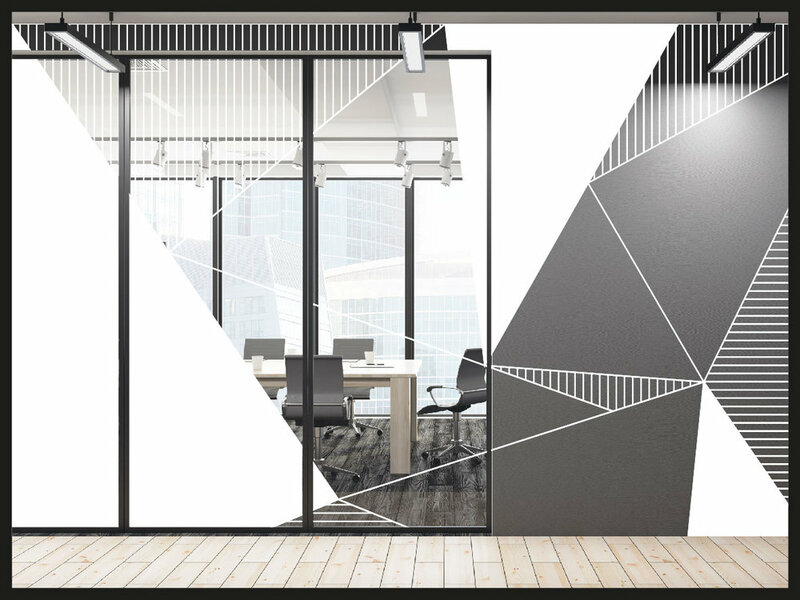 The “Custom Geometric” design is a combination of striped, solid and transparent shapes that can be manipulated to fit to any space. In this example it seamlessly flows from the wall through to glass and creates an impressive statement. Taking this approach through your fitout can potentially bring a room together and create a space that is visibly pleasing and leaves an impression on both clients and employees. This design is one of many of our designs that can be executed to flow from wall to glass without being too busy. For more designs like this check out our Pinterest page! With Summer coming to a end and Autumn around the corner, we thought we would celebrate the end of season with a new design. 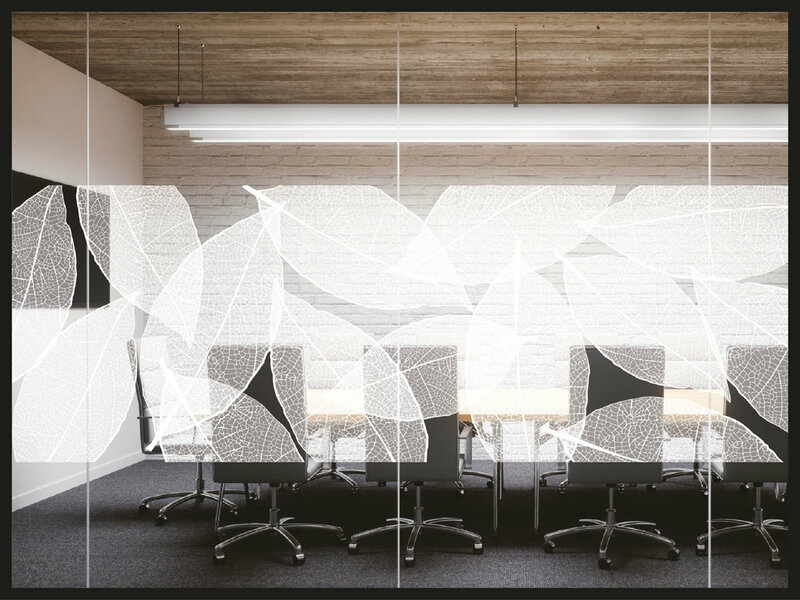 We’ve been noticing natural and light graphics are a growing trend for interior fitouts, with the inspiration of the outdoors coming into working environments to encourage productivity and employee satisfaction. This was the inspiration behind our new addition to the design range called ‘Glide’. Digitally Printing white onto Frost brings out the tiny details that make this design so unique and lifelike. Be sure to check out our Pinterest page, we are constantly uploading new designs on there every month with the hope it gives you some inspiration for your next project! There’s nothing like starting the year off with a whole new look and Tint Design has done just that. Our factory has been freshly painted and presents clean, proud and ready to go! This face lift has given our team motivation to start the year with our best foot forward and we are ready and looking forward to what we can, and will achieve in 2019! We love the sentiments and hope that “playful expression” inundates the interior design world so that our newer printers really get a chance to show you what they’re capable of. The design above is a new one that we’ve popped into our Catalogue to celebrate the announcement and we’d love to know what you think! What a great way to burst into 2019 by reflecting on the some of the highlights of 2018! After a great year and a variety of different projects that highlight Tint Design’s vast range of services and supply options, we can’t wait to see what’s up next! In 2019 we are also excited about the new products and services that we are launching this year so keep an eye out for our monthly newsletter - if you’re not already a subscriber be sure to click here and sign up! We are keen and raring to go, so please contact us if you’d like us to advise, provide a sample, or quote on your next project! At Tint Design we occasionally assist on projects that are a little outside of our usual scope of works but we’re pleased to say that the final result of this particular project was worth the extra effort. Elliat Rich’s Other Places – Mirrors were exhibited in early 2018 at the Sophie Gannon Gallery in Melbourne as a part of the Design Work 02: Elliat Rich, Dale Hardiman and Chen Lu exhibition, presented as a part of the NGV’s Melbourne Design Week. The works were also recently featured in the November/December issue of Vogue Living Magazine’s VLove shopping guide. Congratulations Elliat the final result was stunning! For more information on this artwork please contact the Sophie Gannon Gallery. A few months back you might have seen that we added not one but two new Mimaki 5 layer UV printers to our machinery inventory and we couldn’t be happier with the quality of the prints we’re getting out of them. Five layer printing allows us the ability to print two contrasting colour schemes visible on opposing sides of the same print. This means that for something like a Safety Decal, for example, you would be able to print one colour scheme to be visible from one side of the glass that complies with the 30% contrast to its back ground and a varied colour on the other side to achieve the same code compliance when visible from the other side of the glass. Another good example would be an entry logo on a glass door - design your logo artwork to be viewed positively when your visitors enter the room as well as when they exit! Creativity is the key to this new technology and we can’t wait to see how our clients embrace the challenge! More fun in the office! As you can see above, acoustic paneling has endless possibilities. You can combine the product’s range of colours and thickness, and custom cut them to any shape desired. We wanted to have some fun and experiment in this space which has been a major success! Acoustic panels are an extremely popular wall finishing solution and a vital part of many fitouts. At Tint Design we can turn a dull room into a statement one, by using our Vision Effex and Precision Cutting services. The design possibilities are limitless for creating stand out features from a practical substrate. We love how this office turned out and we hope we have inspired you to bring out your creative side. We pulled these photos out of the archives, which was a job we did for the Spring Racing Carnival in 2017. The private marquee in the Bird Cage featured acrylic panels to which we installed dichroic window film. 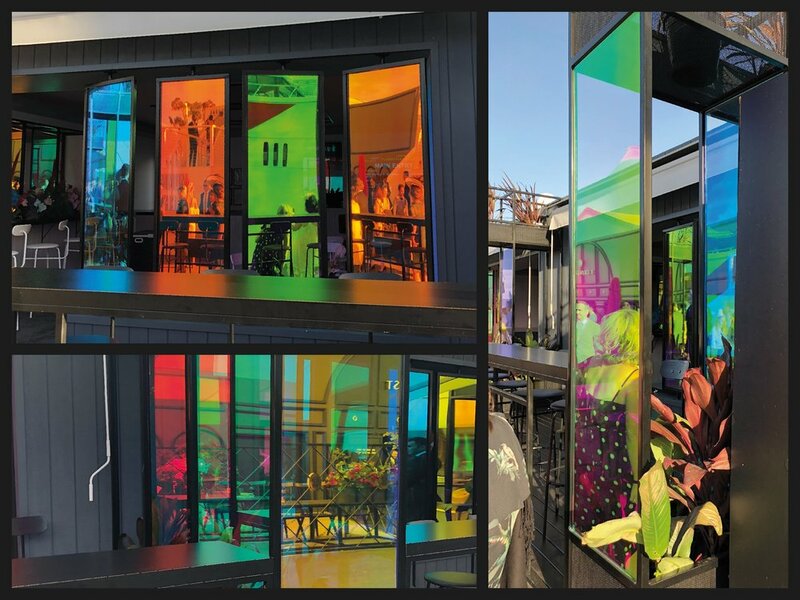 As you can see from the pictures above, the film creates a harlequin effect which was a unique and colourful rainbow like choice for the 2017 Flemington fitout. An event like this is a great opportunity to be creative using bold and unique products and designs. Be it fashion or interior fitouts, it’s always exciting to watch the Carnival to see what’s on trend!